Before a fresh or frozen food machine is placed we will need to evaluate the account before we commit. Food machines are very expensive and we need a large volume of employees or multiple shifts to make it work. A frozen or fresh food machine is a great compliment to a beverage and snack vending program. The machines can be equipped with a variety of fresh and frozen foods that includes burritos, sandwiches, hot dogs, burgers, ice-creams and a host of other products that can satisfy employee needs for food on the go. In order for a food machine to be successful we need to really find out what selections your employees would enjoy. We do this by sending in a pre- installation survey so we can gain a clear understanding of the products that will need to be stocked. As well as food items the food machines allow us greater freedom in drink selections. We will include a variety of beverage items as well like sparkling waters, juices and milk for complimentary products like cereal. 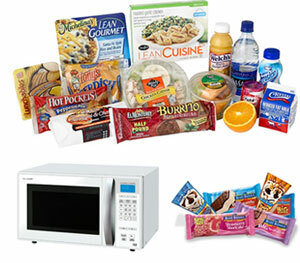 When placing food equipment we usually like to work a deal that includes microwave ovens so the food can be heated after purchasing it from the vending machines.